Dozens of Palestinian cyclists staged a protest on Friday morning against the Giro d’Italia Cycle Race that is, they insist, part of Israel’s “Judaisation” of Jerusalem, news agency has reported. The protest started in the occupied West Bank city of Ramallah and headed towards occupied Jerusalem. 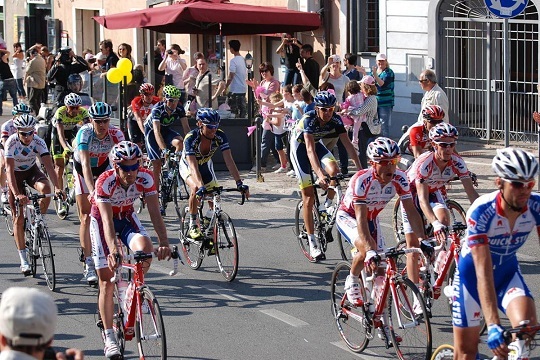 Giro d’Italia is an Italian race which is, for the first time, being held outside Europe. Competitors were in Jerusalem to mark the 70th anniversary of the establishment of Israel, what the Palestinians refer to as the Nakba, Catastrophe, because the state was established on their land. The Palestinian protest was organised in cooperation with the Boycott, Divestment and Sanctions (BDS) movement. Protesters were stopped at the Qalandia Checkpoint, an Israeli military base between Qalandia and Jerusalem. “The message of the cyclists’ protest is to tell Giro d’Italia: Stop your support for the [Israeli] occupation,” BDS activist Zaid Al-Shoabi told news agency. He stressed that the international race is intended to support the Israeli occupation of the capital of the Palestinian state, Jerusalem. The Palestinian Authority warned on Thursday that the international race promotes the Israeli narrative about the holy city. According to the Foreign Ministry, the route of the race included 10 kilometres through the occupied city of Jerusalem. “This is a flagrant violation of international law,” it added. Giro d’Italia 2018 included two teams from the UAE and Bahrain, part of the Arab rush to normalise ties with the Israeli occupation state.